by Toby Ward - The process of planning an intranet, and the role of executive management and end users in developing the plan, determines the potential success of an intranet. Success has many measures, and largely depends on subjective opinions, but regardless of the metric, I rarely see true intranet success. I’ve worked with award winners (including companies that have won big intranet awards such as the Nielsen Norman 10 best intranets of the year), and I’ve worked with a lot of organizations and Fortune 500s that have better than average intranets. True intranet success is not often achieved (or held for long), and most intranet managers and champions at those companies often rate their own intranet as satisfactory at best – less than truly successful – and requiring a lot of work. I refer to the collective intranet facets or requirements as the Nexus of Intranet Success. Nexus [‘nEksIs] comes from a Greek word meaning ‘meeting place’ (a fitting label given the intranet’s importance as the only true, universal meeting ground or ‘water cooler’ in the average organization). The Nexus model, which has been updated and tweaked recently (first developed in 2003), is intended to represent the desired end-state, not the process for getting there. I’ve been known to say that the intranet is not a technology system or IT project, nor is it a communications vehicle or channel; the intranet is a business system that should represent and support all areas of the business. In fact, the intranet is really only one part technology, and many parts people and process (including planning, governance, content, etc.). The most critical determinant of an intranet’s success – and I cannot stress this enough – is people. In particular, the crucial participation and support of senior management (the heart or inner ring of the Nexus model: Executive Support) and the end users (the all encompassing factor represented by the outer ring ‘Motivated Users’ of the Nexus model). The model therefore visually depicts the significant importance of people. Ironically, the engagement of both senior management and end users are critical tasks during the Planning of an intranet (specifically, the Assessment and Planning phases of Prescient Digital Media’s intranet project methodology depicted below). While some levels or factors may, on the surface, seem more important than others, optimal intranet success requires success on all levels; each level working in conjunction with one another (thus the relevance of the ‘Nexus’ and the depiction of the three levels as concentric circles). 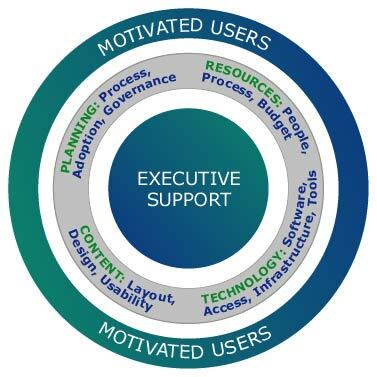 While it can be argued that motivated users are far more important than executives, it can also be argued that if an intranet has the necessary support, funding and resources from senior management, the intranet is often well supported and successful, which naturally draws users (or ‘pushes’ users to use the intranet). 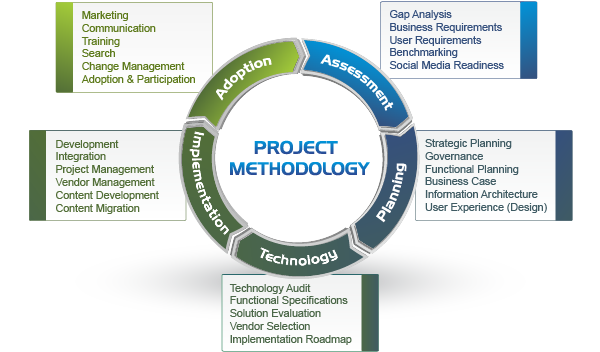 Ironically then, it is the Planning activities (and those Assessment activities depicted in the Intranet Project Methodology illustration), that builds and secures the necessary support from both the organizations executives and the end user employees. At the centre of the Nexus or the heart of an intranet’s potential for success, is executive support – both moral and financial support. Many organizations have intranets that are mid-management or grass-root initiatives, and some enjoy a certain level of success. However, the potential of your intranet will never be fully realized without real executive support and a senior management champion (ideally either the CEO or CIO or Chief Communications Officer or equivalent). The number one challenge facing corporate intranets today is not technology, nor tight budgets, but rather internal politics, specifically, the politics of competing priorities and management agendas. The second biggest hurdle is a financial one. To win these challenges you need senior management in your corner. Before the project (build or re-design) can gain executive support, it must be presented and marketed to demonstrate how it can help the organization achieve its goals and objectives. The intranet, insofar as it relates to company profits, earnings and revenue can generate a sense of need and urgency to launch the project. One way of pitching this idea to executives, as Holtz suggests, is to bring the executive team’s attention to articles from business publications that explain how other companies have achieved bottom-line success through the application of online technology. "Too many intranets and portals fail or don't live up to their potential because they lack direction and often become a political football torn between rival groups and competing priorities,"
Without thorough planning, your intranet may fail (often the failure takes years as the absence of proper governance and decision-making ensures the intranet is not fixed, but rather sits in purgatory). In fact, executive support is defined and secured during the planning phase. Also critical to the Planning phase, is the incorporation of both the organization’s business requirements, and those of the end user employees. Without solid research and a detailed business requirements analysis, your intranet could significantly miss the mark. An intranet manager at a major communications company once lamented about the phenomenal amount of wasted time, money and effort exhausted in evolving their enterprise intranet portal (serving tens of thousands of employees). In one year, the intranet was redesigned three times – sucking significant funds and patience from an organization that should be using the intranet to support rather than drain the bottom-line. Of an extended team of more than a dozen people working on the intranet, only one person remained after a year. Failure to develop an integrated plan that accounts for an organization's structure, stakeholder and user requirements will certainly ensure failure and, with it, a loss of significant time, money and often jobs. "Too many intranets and portals fail or don't live up to their potential because they lack direction and often become a political football torn between rival groups and competing priorities within an organization," says Carmine Porco, vice president of Toronto-based Prescient Digital Media, a veteran consultant who has also worked for Cisco and Deloitte Consulting. "First, you have to get your stakeholders to agree to the strategic plan and vision and on how the intranet should work and evolve. But you also need to understand what employees want and expect; and then marry the two." True intranet success is rare. To be truly successful, the intranet requires a thorough plan that incorporates all of the requirements represented by the levels of the Nexus of Intranet Success model. Success is often pre-determined by the understanding and support offered by your organization’s executives (senior management) and is delivered by motivated users who keep returning. The Planning provides the game plan or guide book that addresses all of the organization and user requirements, and serves as foundation or blueprint for success. To learn about Prescient's intranet planning services, please see our Intranet Blueprint service. Toby Ward, a former journalist and prominent writer and speaker on intranets and intranet planning, is the President of Prescient Digital Media. To learn how to undertake effective intranet planning, or to get our free intranet white paper, Finding ROI, please contact us directly.